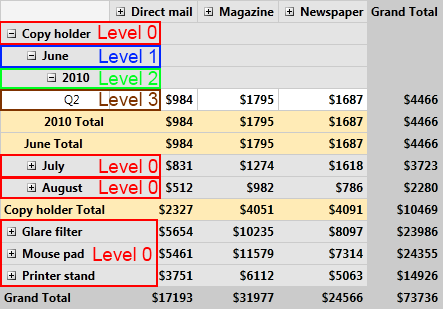 In this article we will show you how to change the initial expand/collapse behavior of RadPivotGrid rows and columns. Initial state is the state of RadPivotGrid after refresh of the used data provider. Expanded - bool property which controls the state. When it is true the groups will be expanded. When the value is false the groups will be collapsed. UpToLevel - integer property which controls the levels for which to apply the behavior. You can combine the two properties to achieve the desired result. The default value of Expanded property is true, so if you don't set it (or if you do not set ExpandBehavior), all groups will be expanded. If you do not set UpToLevel, the behavior will be applied to all groups (which is its default state). For example, if you set Expanded = false and UpToLevel = 2, all levels up to the set one (levels 0 and 1) will be collapsed, all groups with level greater than or equal to 2 will be expanded. So at initial state you will see all groups collapsed, but if you expand the first two levels, all other groups below them will be expanded. RadPivotGrid has two properties to control the expand behavior - RowGroupsExpandBehavior and ColumnGroupsExpandBehavior. As you can guess, the first one controls the expand behavior of the rows and the second one - columns behavior. If you do not set these properties, all groups in rows and columns will be expanded. If you want to collapse all groups in RadPivotGrid you can change the behavior at runtime and refresh the data provider to apply the change immediately. For example, you may add two buttons in your application and handle the click event for each of them in order to expand / collapse the groups. Note that the new behavior will be applied each time when the data provider is refreshed. You can download the ExpandBehavior demo from our SDK Samples Browser.